Eltherington, based on Dansom Lane South in Hull, has made a quarter million pound investment in its stockholding business as it looks to build on recent growth. Part of the larger Eltherington Group the stockholding business supplies aluminium extrusions, sheet, plate and bars to fabricators and specialist manufacturers across the region. Following a major revamp, which involved the introduction of new products, new pricing structure and an updated website, the company is confident that it has created a strong platform for further growth. Service improvements resulting from the investment made by Eltherington include same-day and next-day delivery options*. 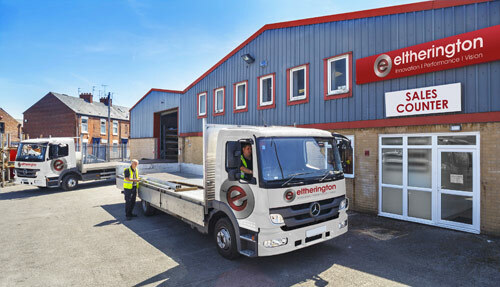 This is a major benefit for Eltherington’s customers as it means they are able to hold less stock as part of a Just in Time procurement system, freeing up working capital in the process. As well as selling to trade, the company operates a Sales Counter from Gate 6 on Dansom Lane South, which welcomes public and DIY’ers. The wide selection of products and knowledgeable staff make it ideal for DIY’ers looking to create anything from ornamental metalwork for the garden through to shelving and general storage units. Eltherington Group is a major employer in Hull and has been trading from the Dansom Lane South for over 50 years. Along with stockholding, Eltherington manufactures specialist products for the architectural, modular building and leisure home sectors. The company has supplied several high profile projects in the region including perforated aluminium cladding for The Arc in Hull and the metallic blue roof elements for Hull Kingston Rovers RLFC. The Eltherington Stockholding Sales Counter is open 7am – 6pm Mon to Thu and 7am – 5pm on Fridays. Customer should go to: Gate 6, Dansom Lane South, Hull HU8 7LA. *Next Day deliveries available direct on own fleet to all HU, DN, S, WF postcodes plus YO42 & YO43 postcodes. Other areas require prior confirmation, next day carrier options are also available. Eltherington Group is a family owned company that has been supplying cladding and glazing systems plus numerous aluminium engineered products for over 50 years to the Architectural, Caravan and Portable Building markets. Guy Stubbs has been appointed as Group Operations & Supply Chain Director. Guy has almost twenty years successful experience within our business and is already well known within our Caravan & Portable Building markets. In his new role, Guy will head up all Operational areas within the Group covering Caravan Cladding, PVC Glazing, Architectural Fabrications, Aluminium Stock Distribution, Logistics and After Sales. Mike Riding has been appointed as Group Business Development Director. Mike has developed a wealth of invaluable technical, customer & market knowledge during his twenty seven years with the Company. In his new role, Mike will be further developing customer and new sales opportunities within both existing and new markets namely Architectural, Caravan & Leisure plus Portable / Modular Build. Dave Johnson has been appointed as Group Technical Director. Dave joined the Company in 2004 and has been at the forefront of cutting edge research & development on many of our current cladding & glazing systems. Dave will lead and develop our Technical support to our valued customers and also his team will continue to deliver on our many exciting Research and Development projects. “I am delighted to make these three key appointments from internal talent that have progressed over the many years at our company. All three Directors bring a wealth of proven success and expertise from current and previous roles at Eltherington. We have a challenging array of plans over the coming years and I’m excited to be joined by this team in our next phase of development”. CommentedAntony Eltherington, Group Managing Director.